The highest mountains in Siberia, the Altay, are located in southern Western Siberia, extending to Kazakhstan, Mongolia, and China. The mountains represent a complex system of chains separated by large valleys with a number of distinct provinces (Figure 14.2). The western province incorporates the southern and the Ore Altay, with altitudes increasing from 2000-2500 m in the west to 3200-3900 m in the east, separated from each other by a succession of latitudinal valleys. Typical of the south-eastern and eastern provinces are peneplanated hilly uplands (e.g., the Ukok and Chulyshman plateaux) and vast flat-bottomed intermontane depressions which locally are known as 'steppes' (e.g., the Chuya Steppe and Uymonsk Steppe) because of the predominance of steppe vegetation. This region also accommodates the highest area in the Altay, massif Tabyn-Bogdo-Ola (The Five Holy Mountains). Its major peak, the Kuitun, reaches 4356 m. High altitudes (with ridges extending above the snow line) and strongly dissected relief are typical of the central province. Characteristic of the northern, north-eastern, and north-western provinces are strongly eroded ridges with an altitude of 1800-3000 m, and vast plateaux. Practically all scientists agree that the Altay was glaciated three times during the Quaternary (Rakovets and Shmidt, 1963; Devyatkin, 1965; Markov, 1978; Seliverstov, 1982). However, there is still controversy about the age and status of the glacials. Thus Markov (1978) identifies the early, middle, and late Pleistocene glaciations while Seliverstov (1982), Okishev (1982, 1983), and Devyatkin et al. 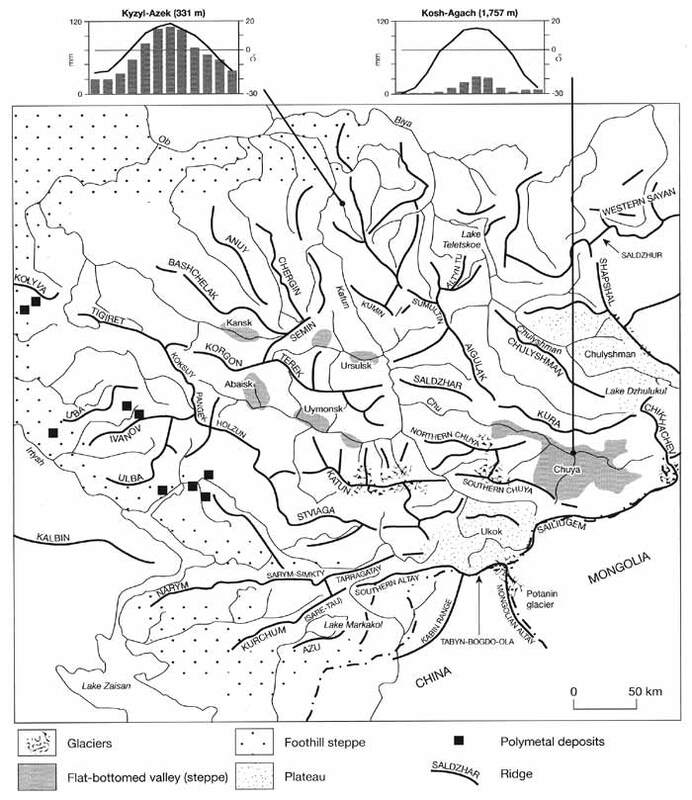 (1989) argue that the Altay was glaciated once in the middle Pleistocene and twice in the late Pleistocene. The opinion of Markov and his co-workers is based on the age of deposits found in the Chuya valley. This thin (0-5 m) layer of till, overlain by varve clays, is the only evidence for the early Pleistocene glaciation and the recent thermolumines-cence dating of these sediments has produced younger age estimates. 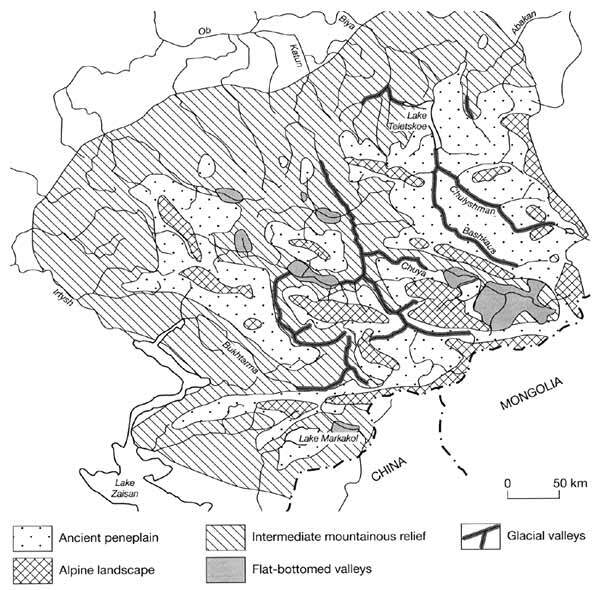 By contrast, evidence of middle Pleistocene glaciation is abundant in the Altay. Although ice occupied extensive areas, the middle Pleistocene glacial was of a reticulated nature. The strongly dissected topography with a developed river network, large relative elevations, and steep slopes prevented the development of an ice sheet (Okishev, 1983). Only on the Ukok plateau did an ice cap develop during the glacial maximum. Glaciers left few marginal formations, perhaps, because they ended in ice-dammed lakes, although a few moraine ridges and hills, cirques, and glacial troughs attributed to this time exist (Seliverstov, 1982). In many areas, for example in the Chuya valley, glacial diamict occurs. This glaciation, termed locally the Katun glacial, correlates with the Samarovo glaciation in Siberia. The interglacial, separating the middle and the late Pleistocene glacials, was of a considerable length as indicated by deep river incision and strong denudation of the middle Pleistocene glacial deposits. The next glacial known as Maimin, which has left a visible impact on landforms, began at the very end of the middle Pleistocene-beginning of the late Pleistocene. The extent and thickness of ice cover were smaller than during the previous glacial epoch. Mountain valley glaciers prevailed and the ice was about 300 m thick, reaching 500-600 m in the areas of glacier confluence. Only on the plateaux of the extreme east and south-east was glaciation probably of reticulated type. According to Okishev (1982, 1983), the expansion of the ice was controlled by a decrease in summer temperatures. This view is based on pollen spectra from extraglacial areas which have a very high proportion of pollen of such typical cold steppe plants as dwarf birch and Ephedra (Boyarskaya and Chernyuk, 1976). The latest Chibitsk glacial, which correlates with the Sartan in Siberia, was separated from the Maimin stage by a lengthy period of glacial retreat which lasted until 16 Ka BP. The Chibitsk ice occupied a much smaller territory and was restricted to the montane valleys. The geomorphology of the Altay results from its complex geological history, repeated folding, and glaciations. Three major types of landscape are represented: the ancient peneplain, alpine glacial relief, and intermediate mountainous landscapes (Figure 14.3). The ancient peneplains are among the most remarkable features of the Altay and account for approximately one-third of its total area. These are sharply defined broad elevated plateaux from which isolated peaks or ridges, composed of more solid rocks, emerge, attaining relative elevations of 200-400 m. Such formations are particularly characteristic of the southern and eastern Altay, the Ukok, Chulyshman, and Ulugan plateaux being typical elevated peneplains. Zarudny and Rezanov (1968) distinguish four categories of peneplanted surfaces according to their age (Figure 14.4). The highest (3000-3200 m) and the most strongly eroded surfaces are the remains of the peneplain formed in the Mesozoic and Paleogene; the lowest surfaces are of Pliocene age. Many plateaux with an altitude of over 2000 m have periglacial landscapes with moraines, boulders, and shallow lakes of glacial origin (Istorya ozer severa Azii, 1995). One of the largest Altay lakes, the Dzhulukul, which has an area of 33 km2 and a depth of only 7 m, belongs to this type. The alpine landscapes, which are limited in extent in comparison with peneplanted surfaces, are typical of the most elevated (up to 4000-4500 m) parts of the Katun, Chuya, Kuray, Sailyugem, and Cikhachev Ridges. Their relief is strongly dissected, with strong contrasts in elevation, glacial valleys and cirques which often contain lakes. The intermediate mountainous landscapes develop between 800 m and 1800-2000 m predominantly in the northern and western regions and account for approximately a half of the total Altay area. The intermediate mountains are strongly dissected by a well-developed hydrographic network and river valleys reach 300-800 m in depth. These landscapes were probably formed through the erosion of the peneplain as indicated by the occurrence of levelled ridges and isolated peaks. The marginal sections, where the intermediate landscapes pass into the foothills, have been eroded particularly strongly and as a result of selective erosion, locally the landscape acquires the character of the rock outcrops. In recent years, much attention has been given to catastrophic flooding caused by the failures of ice-dammed lakes (similar to those caused by outbursts from the ice-dammed lakes Missoula and Bonneville in North America). Although these were first described at the beginning of the 20th century, detailed analysis was done only in the 1980s, most notably by Rudoy (Rudoy, 1988a, b; 1990; Rudoy and Kirjanova, 1990). Recently, a number of papers were also published in English (e.g., Rudoy and Baker, 1993; Carling, 1996). Many of the flat-bottomed valleys are former lake basins which were formed when streams were dammed by glaciers or moraines during the intermediate interval of the late Pleistocene glaciation, when most of the intermonate basins were deglaciated. The hypothesis of gigantic damming of rivers (including the greatest rivers of Western Siberia) and associated lake outbursts was put forward by Grosswald (1980), while the more recent reconstructions have suggested smaller-scale episodes (Velichko et al., 1984). Although the exact scale of events is still disputed, the existence of the ice-dammed lakes and the occurrence of catastrophic flooding have been confirmed as regionally extensive phenomena of the late Pleistocene glaciation. There is ample evidence in landforms and sedimentary deposits testifying to such events. For example, duneflelds are a distinct feature of the Altay geomorphology. A number of fields are located in the Kuray and Chuya valleys which were occupied by the two largest lakes which together held at least 1000 km3 of water during the latest Pleistocene glaciation (Rudoy, 1988b). Most spectacular is the Kuray field composed of coarse-gravel dunes, which are between 15 m and 200 m long and 1 m and 16 m high, while other fields have dunes of smaller dimensions (Carling, 1996). Reconstructions of the hydraulics of the paleofloods suggest that the discharges from the Altay glacial lakes might have been among the most dramatic cataclysmic floods. According to the estimations by Baker et al. (1993), the failure of the Kuray and Chuya lakes produced flows which reached a depth of 400-500 m, a peak velocity of 20-40 m s-1, bed shear stress of 5 x 103-5 x 104 N m-2, and stream power of 105-106 W m-2. Although such streams were short-lived, they were capable of producing an enormous amount of geological activity in a very short period of time. However, typical of the Altay is the disproportion between the large and deep valleys drained by relatively small rivers that cannot be attributed solely to paleofloods. Most of the large valleys have a tectonic origin and the general outline of the modern river network has been inherited from that of the Neogene (Ivanovsky, 1962; Rakovets, 1979). The largest lakes of the Altay, the Teletskoe (surface area 231 km2) and the Markakol (445 km2), are also located in the tectonic depressions. The basin of the Teletskoe lake, which is the world's sixth deepest lake (maximum depth 325 m), is a graben formed about 36 Ka BP. The large Chulyshman glacier further expanded and deepened its elongated valley (Baryshnikov, 1992; Istorya ozer sevem Azii, 1995). The climate of the Altay is controlled by its position in the southern part of the temperate zone and almost in the centre of Eurasia. The latitude of the Altay between 48°N and 53°N predetermines a high level of insolation (100-120 kcal cm-2 a-1). Strong continentality manifests itself in the sharp seasonal thermal and precipitation contrasts. In winter, the region is dominated by the Siberian anticyclone which effectively blocks precipitation in the eastern regions except in the high mountains. Temperatures are low. Mean January temperatures vary between -16°C in the foothills and -32°C in the enclosed depressions in the middle and high mountains such as the Kuray, Chuya, and Bertek (Figure 14.2). Strong temperature inversions are a characteristic feature of the Altay winter climate. Summers are warm and relatively humid, although the duration of the warm period depends on altitude. Advection from the Arctic frequently causes cold spells. Mean July temperatures vary between 15-18°C in the low mountains of the northern Altay, through to 8-9°C at the tree line and 5°C at the snow line (Marinin and Samoilova, 1987). Above 4000 m, mean July temperatures are usually negative. Precipitation is brought mainly by the northwesterly flow but regional precipitation is complicated by topography. In general, the western and northwestern slopes (in particular, the Ore Altay) receive much larger amounts than the central and especially the south-eastern ridges. Annual sums of precipitation vary widely between 100-200 mm and 1500-2000 mm, depending on altitude and exposure. Although only a few ridges rise above the snowline, their cold and relatively humid climate predetermines the widespread development of glaciers. The snow line is positioned relatively high and its altitude increases from 2100 to 2300 m in the more humid western regions to 3250-3300 m in the south-east, varying between south- and north-facing slopes. Thus, on the north-facing slopes of the Katun and Chuya Ridges, the snow line lies between 2500 m and 2900 m, rising to 2700-3100 m on south-facing slopes; in the southern Altay, Chikhachev, and Tabyn-Bogdo-Ola Ridges its altitude varies between 2850 m and 3500 m. Until the middle of the 19th century, the Altay mountains (as well as the Sayans) were thought to have no glaciers. It was only in 1835 that the first two glaciers with a total area of 2.5 km2 were discovered and only at the very end of the 19th century that the first extensive survey of the Altay glaciers was undertaken and over 150 with a combined area of 230 km2 were discovered (Arefiev and Mukhametov, 1996). There are more than 1500 glaciers in the Russian Altay with a combined area of 910 km2 (over 2300 with an area in excess of 1500 km2 including Mongolian and Chinese sectors) and a total water reserve of 39 km3 (Revyakin et al., 1979; Dolgushin and Osipova, 1989). The largest glaciers are the Tabyn-Bogdo-Ola ice dome (22.5 km2), the Great Taldurin (28.2 km2), and Alakhinsky glaciers (19.2 km2). The largest glacial regions occur in the central Altay and the southern Altay. The central Altay region has glaciers of the alpine type concentrated largely in the Katun Ridge which accommodates 390 glaciers with a combined area of 283 km2. The largest valley glaciers take their beginning on Mount Belukha (at 4506 m the highest Altay summit within the FSU) while both in the higher eastern and lower western sections of the ridge glaciation becomes more sporadic and small glaciers predominate. The Southern Chuya Ridge has 243 glaciers (many of which are small valley glaciers) which cover an area of 223 km2. The northern slope is heavily glaciated and the largest in the Altay, the Great Taldurin glacier, is located here in the Yiktu massif. Glaciers of the Northern Chuya Ridge total 118 and are concentrated mainly in the massif Bish-Yirdu. The southern Altay region includes glaciers of the southern ridges and of the Tabyn-Bogdo-Ola massif which is the largest glacial centre in the Russian and Mongolian Altay. The total glaciated area in the Tabyn-Bogdo-Ola reaches 222 km2 but only 33 km2 occur in Russia. According to Okishev (1982), there were six stages of glacier advancement in the Holocene: the Ognev stage (about 9.4-9.6 Ka BP); the Multin stage (7.6-7.8 Ka BP); the Kuchurlin stage (5.7-5.8 Ka BP); the Akkem stage (3.8-3.9 Ka BP); the historical stage (the first millennium AD); and the Little Ice Age (17th-19th centuries). Although it is possible to distinguish these broad periods, research on the first five intervals has been limited and the Little Ice Age is best known. Traditionally, the maximum glacial advance was dated to the middle of the 19th century. However, the more recent radiocarbon and lichenometric studies have shown that moraine complexes may incorporate evidence for several neoglacial episodes chracterized by regional and local variations (Kotlyakov et al., 1991; Serebryanny and Solomina, 1996; Solomina, 1999). Much of the work on paleoglaciological reconstruction has been undertaken in the Aktru valley in the Northern Chuya Ridge. Lichenometric dating of terminal moraines of the Great Aktru and Little Aktru glaciers has shown that the earliest of the Little Ice Age advances occurred in the 15th century. Later, both glaciers expanded synchronously (i.e., in the 15th and late 18th centuries, 1800-30, and 1911-14) but the timings of the maximum advance were different. Thus, the most significant expansion of the Great Aktru occurred in the 17th century while the Little Aktru reached its maximum size at the beginning of the 19th century (Ivanovsky and Panychev, 1978). These ages are in agreement with the results of dendrochronological studies which have shown that exceptionally low summer temperatures (2.0-2.5°C lower than at present) occurred in 1560-1600, 1690-1715, 1785-1805, and 1810-50 (Adamenko, 1986). Glacial advances require not only cold but also wet conditions. It is impossible to reconstruct budgets of the Altay glaciers prior to 1838 because of the absence of precipitation data. A budget reconstruction for the Little Aktru glacier since the second half of the 19th century has shown that, because of low precipitation, a progressive retreat occurred between 1838 and 1889, despite the low temperatures and low ablation. Not until 1890 did an intensive (albeit short) advance of the glacier begin (Narozhnyi, 1986; Kotlyakov et al., 1991). At present, the Altay glaciers are in a state of retreat. The glaciated area shrinks while their number increases because of the disintegration of the larger glaciers (Revyakin, 1981; Mukhametov and Revyakin, 1986; Marinin and Samoilova, 1987). Thus, at Mount Belukha, the combined glaciated area declined by 15 per cent in comparison with the mid-19th century, while the number of glaciers increased from 6 to 25. The Katun glacier retreated by 1400 m during the last 150 years, while another large glacier, the Sofiisky in the Southern Chuya Ridge, retreated by 1700 m. The total glaciated area in the Tabyn – Bogdo-Ola declined by 20 per cent, while glaciers of the Mongun-Taiga massif, which is located on the border between the Altay and the Sayan mountains, declined by 49 per cent. However, warm conditions are not exclusive to the 20th century. Climate amelioration, evidenced by an increase in the altitude of the tree line, which apparently was accompanied by glacial retreat, did occur in the Altay in the past, most notably in early medieval times (Serebryanny and Solomina, 1996; Solomina, 1999). Permafrost has a wide but irregular distribution. In the south-east, permafrost is continuous while island permafrost is typical of the western and north-western regions and only seasonal freezing of the ground occurs in the western and northern margins (Shats, 1978; Geokryologiya SSSR, 1989). Thickness of frozen ground varies between 80-600 m (possibly reaching 1000 m in the high mountains) in the continuous permafrost zone, and 50-160 m and 6-90 m in the zones of discontinuous and sporadic permafrost occurrence (Shats, 1978). Cryogenic processes (e.g., frost weathering and cracking, frost heave, solifluction, thermokarst, and icings) are typical. The high mountains of the southern and the southeastern Altay separate the Arctic and the inner drainage basins and many north-flowing Siberian rivers, such as the Irtysh and the Ob, originate in the Altay. The Altay has a well-developed hydrographic network which includes over 20 000 rivers and streams (small rivers with a length less than 10 km constitute 95 per cent of those) with a combined length of 62 555 km (Marinin and Samoilova, 1987). Lakes are numerous and over 75 per cent of them are located in the south-east. Small lakes predominate, which apparently explains the strong disagreement as to their number: according to Shpilekova (1980) there are 2070 lakes, whereas another survey claims that there about 7000 (Corny Altay, 1971). Rivers and lakes are fed by snow and glaciers. The melting time depends on elevation: in the valleys, snow melt begins in April while glacial melt water is discharged in summer. Therefore, an extended period of maximum flow, maintained by thawing at varying elevations, occurs in spring while in summer a high water level is supported by melting glaciers. In autumn, high water levels are frequently forced by increasing precipitation but they are lower than in spring since most precipitation in the mountains occurs as snow. This river regime is specifically known as the Altay regime (Figure 5.6). With respect to the diversity of soil types, plant, and animal life, the Altay stands out amongst the mountains of Southern Siberia. Twenty main types of soils occur in the Altay. These are grouped in three major altitud-inal zones: steppe and forest-steppe soils up to 800 m; forest soils at 800-2200 m; and alpine meadow and tundra soils at 1600-3100 m. These are further subdivided into belts (Pochvy Gorno-Altayskoi avtonomnoi oblasti, 1978). On northern slopes, altitudinal borders are lower than on the southern ones and landwards the positions of altitudinal zones (in particular, the forest soil zone) change as well as the distribution areas of various soil types. Three mountain soil regions are recognized in the Altay: northern, central, and south-eastern. The northern region, which includes all northern provinces and the Ore Altay has a relatively simple sequence. The lowest belt is formed by leached chernozem, podzol, and grey forest soils while in the north-east mountainous brown forest soils are common. Above 1600 m, forest-tundra and tundra soils occur; the latter often intermingle with rocks. In the central region, strong topographic contrasts predetermine the development of a more complex soil sequence. The lowest belt is formed by chernozem, dark chestnut, and chestnut soils of the large intermontane depressions and wide river valleys. On the northern slopes, mountainous forest soils develop and chernozem-like soils occur under the deciduous park-like forests (Rudsky, 1996). The south-facing slopes are occupied by chestnut soils and locally by chernozems. Above 1800 m, alpine meadow soils occur, succeeded by tundra soils. The severity and aridity of the climate and the frequent temperature inversions are responsible for the formation of a peculiar soil sequence in the south-eastern region. The upper boundary of the mountainous forest soils reaches its uppermost position but the distribution of these soils is limited. In contrast to the other areas, alpine meadow and tundra soils border on the chestnut, light-chestnut, and meadow steppe soils which occupy larger areas than in the other regions. The position of the Altay at a junction of a few bio-geographical provinces and the contrasting habitats explain its high biological diversity. The Altay flora comprises 1840 species, 11 per cent of which is endemic (Kuminova, 1960). 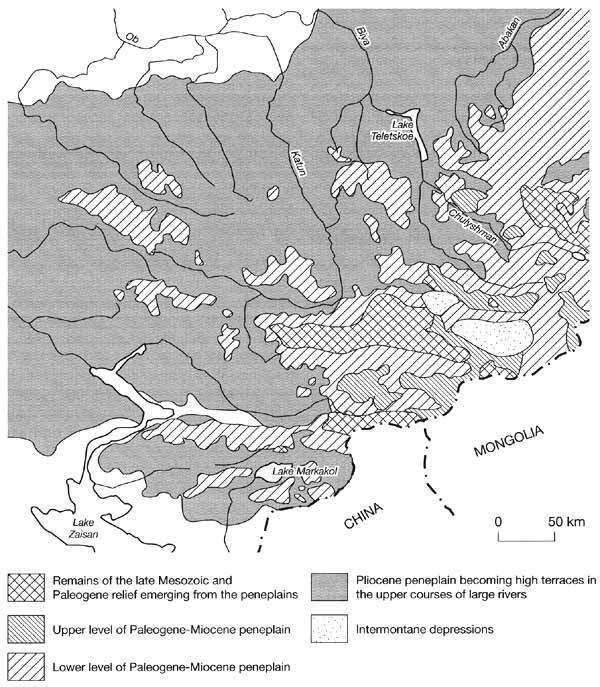 The modern vegetation, formed at lower altitudes by steppe and taiga communities, was formed in the Quaternary after the Tertiary vegetation, represented by broad-leaved deciduous forests extending across Siberia, had become extinct as a result of climatic cooling and repeated glaciations (Grichuk, 1984). The surviving remnants of the Tertiary forests (most notably Tilia sibirica, a species which is morphologically very close to the European T. cordata and the Far Eastern T. amurensis) occur in isolated locations in the Altay which were ice-free. The Holocene climatic fluctuations modified the vegetation, especially the balance between the steppe and forest communities. Thus, in the valleys of the south-western Altay, pollen records reveal a widespread occurrence Abies sibirica and Pinus sibirica forests between 4 and 3.5 Ka BP, indicating humid conditions. Steppe vegetation replaced forests during the cold and arid period from 2.5-1.7 Ka BP when annual precipitation was 100-200 mm lower than now. Meadow steppes and sparse Pinus-Betula-Larix forests became more prominent during the wetter period between 1700 and 800 years ago while the following small decrease in temperature and precipitation caused a declining role of Pinus in the composition of the sparse forests (Mikhailov et al., 1992). Since the middle of the 19th century, human activity has been a significant factor leading to deforestation, expansion of agricultural lands, and the formation of secondary forests. Vertical zonality is clearly exhibited in the distribution of the Altay vegetation. However, it is complicated by topography (e.g., forests often do not develop on plateaux although these are below the tree line) and exposure of slopes (forested northern and treeless southern slopes) and there is no single model for the whole of the Altay. Most authors (Koropochinsky, 1975; Ogureeva, 1980; Rudsky, 1996) distinguish steppe, forest-steppe, forest, high mountain, and nival zones subdivided into belts. 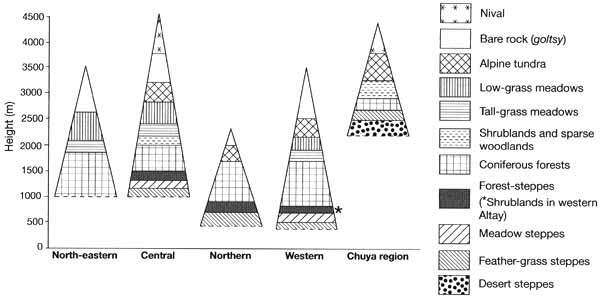 Ogureeva (1980, 1999a) distinguishes five regional vertical sequences (Figure 14.5). Steppe vegetation is particularly typical of the western Altay, while it has a limited occurrence in the northern province and a mosaic distribution in the central province (Ogureeva, 1980). In the west, the feather-grass steppes of the East Kazakhstan type, dominated by Stipa rubens, develop in the lowest 400-500 m zone and are replaced by the meadow steppe communities which occur up to an altitude of 800 m. In the north, meadow steppes develop to 400-700 m reaching locally 900 m. Species, typical of the Siberian steppes and the eastern steppes of the East European plain, such as Stipa pennata, Poa angustifolia, and Carex pediformis, dominate with a participation of Mongolian species such as Stipa sibirica. In the northern provinces, steppes have been strongly modified by human activities, being used as arable lands or hayfields. With increasing contmentality, desert steppes with Stipa glareosa and Artemisia frigida develop in the south-eastern Altay to an altitude of 1700-2200 m including the Ukok plateau and the Chuya valley. Semi-deserts occur locally but do not form a continuous zone. The fauna of the steppe zone exhibits strong connections with Central Asia and Mongolia. It is dominated by rodents and such carnivores as wolf and fox but in the remote regions of the south-eastern Altay rare species such as Pallas' cat and the Tibetan gazelle still occur. Avifauna is represented by birds of prey and those dwelling in wetlands. The forest-steppe vegetation, which succeeds the steppe zone, occupies a limited area between 500 m and 1700 m developing in the valleys of large rivers and on the slopes of intermontane depressions. Woodlands are formed mainly by Larix sibirica which dominates the forest-steppe in the mountains of Southern Siberia (Ogureeva, 1980). Pinus sylvestris and Betula are other common tree species. In general, woodlands and grasslands occupy approximately equal areas. However, woodlands are mainly confined to the more humid northern slopes where grasslands are formed by the meadow steppe communities. On the better illuminated and drier south-facing slopes, grasslands composed of xerophilous species dominate and the only tree species is Larix sibirica, which has low humidity demands (Ogureeva, 1980; Rudsky, 1996). Forests occupy about 70 per cent of the total Altay area, merging in the north-east with the lowland taiga. In the northern and western regions, forests spread to 1700-1800 m; landwards, the tree line rises to 2200-2400 m, reaching glaciers in the eastern Altay. Three types of forest occur within the zone: dark taiga, light taiga, and mountainous taiga. The dark taiga belt, dominated by Abies sibirica, develops between 400 m and 1200 m. The dark taiga formed by Abies sibirica-Populus tremula and Abies sibirica-Pinus sibirica associations with tall herbs prevails in the lower (400-800 m) and upper (800-1200 m) parts of the belt, respectively. It is confined to the more humid environments in the south-western and north-eastern provinces and the western foothills where annual precipitation reaches 800-1000 mm. The light taiga, formed by Larix sibirica, Pinus sylvestris, and mixed Larix sibirica-Betula pendula forests, develops in the foothills and in the central Altay where it extends to an altitude of 1500 m. The pure larch forests dominate in the arid regions in the middle course of the Katun river and the adjacent ridges. There are two types of larch forests: the park-like forests formed by old trees under which thick herbaceous cover develops and shrubs are abundant, and the sparse forests with poor undergrowth and herbaceous cover more reminiscent of the forest-tundra. The Pinus sylvestris forests are typical of foothills, where they can mix with Betula pendula and Populus tremula, lower mountains and river valleys where the park-like forests with a well-developed herbaceous cover dominated by sedges occur. The mountainous dark taiga occupies the upper part of the forest zone between 1600 m and 1800 m. It is formed by the Larix sibirica-Pinus sibirica and monodominant Pinus sibirica forests typical of which is a strong participation of subalpine shrub and herbaceous species. The fauna of the forest zone is more diverse and numerous than that of the steppes. It is similar to the fauna of the West Siberian lowland and represented by such large mammals as brown bear, wolverine, pole cat, elk, musk, and roe deer and the typical taiga birds. The high mountain zone, which is most comprehensively reviewed by Sedelnikov (1988), consists of two belts: the subalpine and alpine. The subalpine belt develops wherever the mountains extend above the tree line and accommodates two formations: shrublands and subalpine meadows (the latter is absent from the arid south-eastern province). Shrublands are composed of Betula rotundifolia, Salix spp., Lonicera hispida, and Ribes fragrans and intermingle with sparse Larix sibirica and Pinus sibirica woodlands. The pristine subalpine meadows are dominated by forest-meadow and subalpine grasses. However, in most regions intensive grazing has strongly enhanced the occurrence of Alchemilla vulgaris and Geranium albiflorum. The alpine belt, which comprises alpine meadows and alpine tundra, reaches its largest extent in the higher central and south-eastern provinces. Kuminova (1960) distinguishes four types of alpine meadows: sedge-sagebrush, tall-grass, low-grass, and those dominated by Kobresia. The sedge-sagebrush meadows develop on humid peneplanated summits, while the tall- and low-grass meadows occur on upper slopes. The Kobresia meadows, which are a transitional formation between alpine meadows and tundra, are typical of the elevated plateaux of the central and southeastern Altay (particularly the Ukok and Chulyshman). The alpine tundra, which has a high diversity of species, accounts for the largest proportion of the alpine zone, being particularly typical of peneplain environments. There are three major types of tundra: mossy-lichenous, shrubby, and rocky. The mossy-lichenous tundra develops mainly in the north-eastern and also in the central Altay. Moss formations dominate in the sheltered moist environments on gentle slopes and bottoms of valleys and may penetrate deep into the forest zone, while lichen-dominated communities are typical of drier sites. Shrubby tundra develops mainly in the central and south-eastern province; it is dominated by Betula rotundifolia with a participation of Carex spp. In the south-eastern Altay, communities dominated by Juniperus pseudosabina occur. The upper part of the belt is occupied by the rocky tundra where vegetation develops only in protected sites. It is represented by associations of mosses, lichens, and the hardiest higher plants, such as Draba wahlenbergii, Sedurn quadrifidum, Saussurea pygmaea, and Saxifraga oppositifolia. The fauna of the high mountain zone is rich in species because many representatives of the steppe and forest zones migrate into high mountains. Areas, close to the tree line, provide habitats for roe and musk deer, stag, and elk; brown bear, wolf, and fox also migrate here. Typical of high altitudes are goat and snow panther; red wolf and argali also occur. The avifauna is rich and represented by such species as white ptarmigan, alpine blue-throated warbler, mountain water pipit, mountain finch, dotterel, snow peasant, and many others.